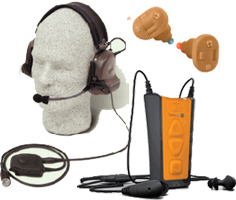 Communications headsets have been developed for all sorts of applications, and for use with many different kinds of communications devices including military and police radios, FMRS frequency general purpose radios, aviation radios, auto racing and motorcycle comm systems. Most such systems can accommodate common plugs such as the 3.5mm standard stereo or monaural plugs that are usually provided with the various types of headsets today, but no matter what kind of connector your communications device requires, there is an adapter or specialty headset that will let you marry the noise protection you need with the ability to communicate. If you do not find what you need among the products listed on this page, please contact us and we will do our best to assist you. In addition to the various types of headsets that will plug into your existing devices, we also offer a number of self-contained two-way headsets that both protect your hearing and let you communicate with no external radios required.